This week was truly beautiful weather with temperatures in the mid to upper 70’s and very little rain. This stable weather pattern was good for fishing as our guests did very well fishing and some having a fantastic fishing trip. Brain, Tammy, TJ Prehm, Omaha, AR were returning for their 2nd trip to Fireside Lodge and Alexa Plummer Kirbyville, MO was here for her first. 1st full day was a very windy day where it was tough to fish where you wanted, but despite conditions they did catch Northern Pike and Smallmouth Bass. 2nd day was terrific catching so many pike they could not keep up with counting and Alexa had a HUGE Smallmouth Bass jump and spit her hook out. 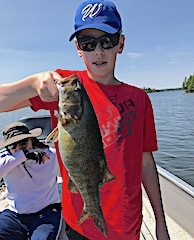 3rd day was great for TJ & Alexa catching many Smallmouth Bass on sinking worms with TJ catching a trophy size plus Alexa had a very large Muskie on and TJ had it in the net unhooked then it jumped right out of the net back in the water. 4th and final day they targeted Smallmouth Bass doing very well catching some numbers and both TJ and Brian caught some big Smallmouth Bass. All left saying they had a great time making family memories together and hope to get back sooner than later. First timers Jeffery & Holli Schneider and Mia Miller from Mingo, IA were happy to be here and referred to Fireside Lodge by 15-year guest Paul Capecchi. DOA all caught fish & Holli had a big fish grab her lure but before she could set the hook the fish spit it out. 1st full day they did terrific catching over 30 Northern Pike and Holli said they had equity in the catching department. 2nd day they caught even more fish, but Holli said there was no fish equity on this day as Jeff had the hot hand. 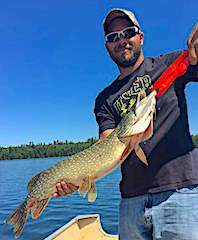 Total catch tally was over 40 Northern Pike up to 31-inches. 3rd and final day was, a wonderful day spent catching some fish and enjoying Twin Falls a wonderful place on our lake system. This family had a great time and made some family memories that will last forever. 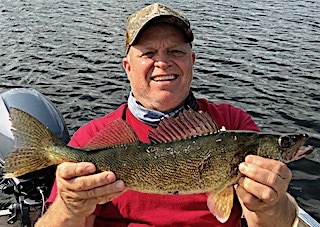 Long time Return Guest since 2001, Tony Kujawa Lansing, IL brought good friend Mike Woolf Tinley Park, IL for his first Canadian Fishing experience. DOA they caught some nice Smallmouth Bass right off the bat. 1st full day they caught 52 Northern Pike having several doubles & no dinks. 2nd day was a Muskie hunting day having them catching 2, and for Mike it was his first, plus they caught some BIG Pike and Smallmouth Bass. 3rd and final day was a great finish catching 22 Northern Pike. Both had a really fun time and for Mike being his first experience he was in awe of the wilderness atmosphere he was fishing in and was hopeful to be returning in 2018. 3rd time returner Alan Favata with son Joe and first time guest Ed Seiler with his two boys Brian & Drew all from Wheaton, IL were her to make some father & son fishing memories. 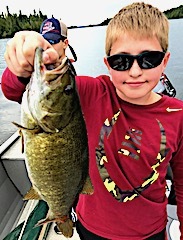 1st day they did very well on Smallmouth Bass catching many 14 to 16-inches and Alan caught 5 Trophy size over 18-inches plus all the boys Brian, Drew, and Joe all caught 18-inch Plus Trophy Smallmouth Bass. 2nd day Al, Joe & Drew caught over 15 Northern Pike while Ed & Brian had about the same. 3rd day was an absolute blast as each boat caught over 20 Northern Pike and after supper all took our Kayaks & Canoes out and enjoyed the sunset while catching a few Smallmouth Bass. 4th and final day was fabulous as Al & Joe caught over 30 fish, a mix between Smallmouth Bass & Pike and Brian & his two boys also did well. All took a break for lunch at Twin Falls with the three boys going for a swim. They were all a little sad to leave having a wonderful time and I applaud the fathers Alan & Brian for making this trip full family fun and lasting memories happen. Return guests, on their 3rd trip with us, were father David Stefanini Olmstead TWP, OH & two adult sons Dave & Todd from Hood River, OR and Upper Arlington, OH. 1st day they caught a lot of medium size Northern Pike and were all but tormented by some BIG Muskie follows that did not respond to any of their offerings. 2nd day they again had a bunch of follows from big fish, and caught some nice Pike with a suspending X-Rap using the pause technique. 3rd day was more of the dame seeing a lot of follows with no takers and catching some nice Northern Pike. 4th day was a good day catching Northern Pike and Smallmouth Bass. 5th day they caught a lot of fish just having a ball with medium size Northern Pike. 6th and final day it was all quantity as they caught Northern Pike consistently all day long and could not keep count. All left having made wonderful father and son memories. Long time return guests Father & son Wayne & Todd Busdiecker from Centerville & Dayton, OH were here to chase the BIG toothy critters. DOA was really great catching 25 to 30 nice Pike in just 4 hours time plus Todd landed a 35-inch Muskie. First day was a slower morning but picked up by afternoon catching a good number of average Pike and had some bigger fish follow. 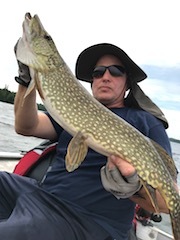 2nd day after some map discussions they tried a few new areas doing very well on bigger Pike and Todd had a huge Muskie hit his surface lure 5 feet from the boat coming clear out of the water and nearly landing in the boat. Todd never had a chance as the Muskie spit his lure as fast as it hit it leaving both Todd and Wayne in disbelief that the event ever happened. 3rd & final day was not their best but they did catching some nice Northern Pike. Both had another very enjoyable father & son fishing trip catching up and making memories. Long time return guests Greg Benton & John McDonough from Grand Blanc, MI were here to Hunt BIG Muskie and Northern Pike. 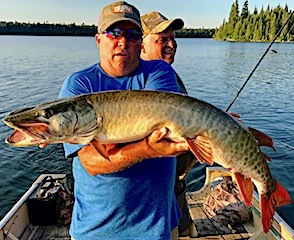 It only took one day for these two to get into some bigger Pike and Greg hooked and landed a very large 44-inch Trophy Muskie on a Grandma Lure with a slow stop and go action. That same evening John caught a very large 38-inch Muskie plus Greg had a tremendous hit while trolling almost taking the rod out of his hand and he could not stop the fish, which after about 50 yards came to the surface, showed himself swirling on the surface before throwing the lure. 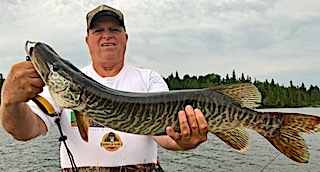 2nd day was another great day catching some bigger Pike, Greg catching a 32-inch Muskie and John came up with this days prize hooking and landing a very large 42-inch Muskie. 3rd day was a good day catching some nice fish but the really big fish only teased them. 4th day they caught some fish and had two very large Muskie follows off a school of open water Cisco. 5th and final day was good in locating Muskie but could only get follows. Both had a fabulous stay and are counting down the days until their return in 2018. Long time Return guests Doug & Mary Bergman from New Lenox, IL retuned with 2nd year guests Scott Rundio Mt Prospect, IL with Brian & Sandra Rundio from Holiday Hills, IL. 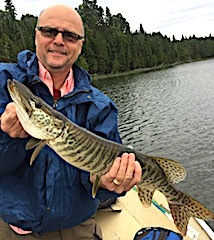 1st day all had a ball catching fish and Mary did not take long to claim her Muskie title catching a very nice 32-inch Muskie. 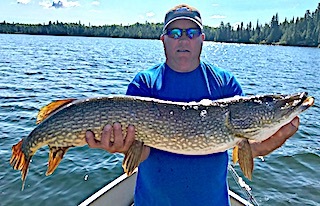 2nd day Sandra, Brian, & Scott portaged to Terry lake and said they caught Pike all day long non stop, while Mary & Doug portaged to Booger Lake saying they had a slower day then in the past catching 50 Northern Pike. Pretty good for a slower day. 3rd day Brian, Sandra & Scott portaged to Booger lake catching over 50 Pike while Doug & Mary had a great day fishing Muskie landing 2 along with 5 bigger Pike and 4 Smallmouth Bass. 4th day Brian & Sandra portaged to George lake fishing pike out of a canoe having a blast catching 15 Pike between 26 to 31-inches. Canoe fishing is much different than fishing from a boat and it was a great learning experience. 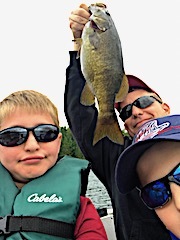 The other three had a super fabulous day catching 150 Northern Pike and several nice size Smallmouth Bass with Doug landing a trophy Smallmouth. 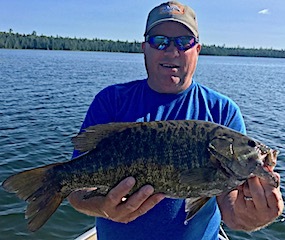 5th day had Doug & Mary catching 51 Pike and 2 Smallmouth and Doug caught his 2nd trophy Smallmouth at 19-inches. 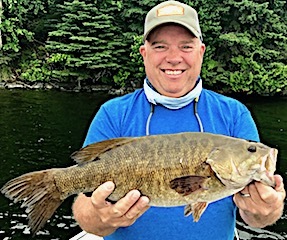 Scott, Brian, & Sandra had a great day catching some BIG Smallmouth Bass, Scott landing an 18-inch Trophy plus he caught 2 Muskie, but Sandra came up with the prize landing a HUGE 38-inch Muskie. 6th & final day had these three getting fast action on Northern Pike until the T-Storms ran them off the lake at 1PM. 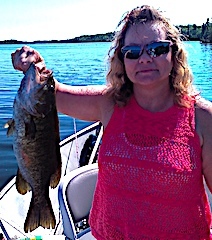 Mary & Doug caught some Smallmouth, a few Northern Pike finishing with Doug landing a nice Muskie. All had a blast during their stay and look forward to their return. 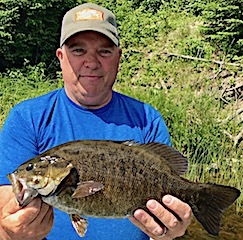 Fish for BIG Smallmouth Bass. 1st day had them searching for Smallmouth Bass find a few and Pat started where he left off last year catching a 19-inch Trophy Smallmouth. 2nd day had them catching Smallmouth bass but having to work for what they caught only being able to catch a fish or two from each spot. 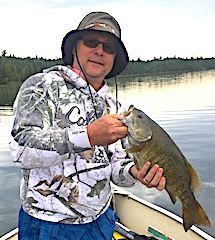 The highlight reel had Larry catching a 17.5 and 18.5-inch Smallmouth Bass. 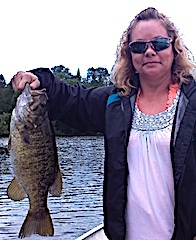 3rd day they portaged to another lake for Smallmouth Bass catching some nice fish between 16 to 18-inches. 4th day had these guys catching 15 Smallmouth Bass with Pat catching a Trophy at 18-inches and Larry an 18.5-incher. 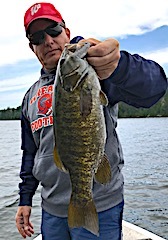 5th day was good, having to move a lot, and ended up the day with 18 respectful Smallmouth Bass including Larry catching an 18-inch Trophy. 6th and final day was very similar to day 5 catching 15 Smallmouth Bass. As always both left having a great time on their traditional fishing. First time guests Frank & Wendy Cunningham from Lake Zurich, IL were glad to be at Fireside Lodge to test new waters. 1st day these two got familiar with Little Vermilion Lake catching some Northern Pike while exploring. 2nd day they did well catching fish, and Frank seeing a Muskie 36-inches and a Northern Pike well over 40-inches laying almost side by side on a rock structure ended up catching the Muskie. 3rd and 4th day they caught some nice Pike in search of a trophy Muskie or Northern Pike 5th day was good catching a good number of Pike but the larger fish were not as agreeable. 6th and last day was their best catching a lot of fish and the bigger fish showed up catching Northern Pike up to the 35-inch range. Both had a very enjoyable time fishing making some new friends, and when departing Frank said he was sad to leave. The Ramsey Brothers Mike, Butch, and Dan from Penn Valley, CA and Hillsboro & Germantown, OH returned for their 6th trip with us at Fireside Lodge. 1st day they knocked it out of the park catching 135 Northern Pike up to 35 inches and several Smallmouth Bass, Dan landing a 17.5-incher plus a Trophy 19-inch Smallmouth. 2nd day for half their day they portaged to Terry Lake catching 79 Northern Pike and 10 nice Walleye between 20 to 26 inches. Third day was just unreal as these three had a fabulous Muskie and BIG Fish day. 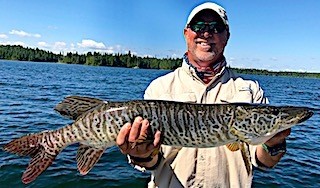 The highlights were catching 2 tiger Muskie plus 2 Muskie, Dan was on fire catching 4 GIANT Smallmouth Bass Trophies measuring 22,21,20, and 18 Inches plus a 38-inch Northern Pike and 42 inch Muskie and Butch caught a mid-30-inch Pike and a 19-inch Trophy Smallmouth Bass. The lure of the day was the Whopper Plopper, of which Dan caught all his fish on. 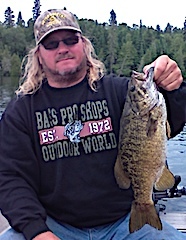 Butch caught his big Smallie on a very similar lure, Teaser Tail, purchased from my Tackle shop. 4th day was a super numbers day with these three catching 202 Northern Pike having 10 triples and many doubles. By the end of their 5th day they walked away catching 423 Northern Pike, 23 Smallmouth Bass, 6 Muskie, and 10 Walleye. These three brothers had an amazing trip and before departing reserved their dates for 2018.